The Nazis took Luka from his home in Ukraine and forced him into a labor camp. Now, Luka has smuggled himself out -- even though he left behind his dearest friend, Lida. Someday, he vows, he'll find her again. But first, he must survive. Racing through the woods and mountains, Luka evades capture by both Nazis and Soviet agents. Though he finds some allies, he never knows who to trust. 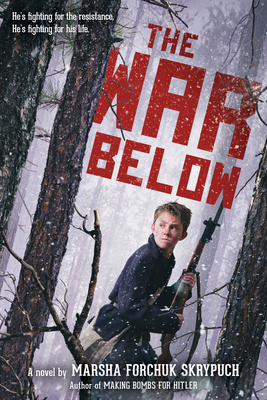 As Luka makes difficult choices in order to survive, desperate rescues and guerilla raids put him in the line of fire. Can he persevere long enough to find Lida again or make it back home where his father must be waiting for him? Marsha Forchuk Skrypuch, author of Making Bombs for Hitler, delivers another action-packed story, inspired by true events, of daring quests and the crucial decisions we make in the face of war.